Documented and confirmed, the calving ease king! 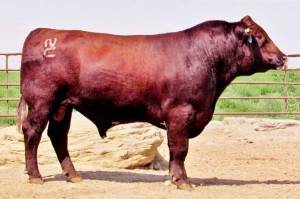 This solid red Canadian bred bull has consistently sired low birth weight calves. His first calves are high quality at Warners, WY & are correct. His calves are vigorous at birth too. THF, PHAF & DSF. Utilitze his unique pedigree and top 1% ranks for CE EPDs.